This is some thing strange when i observed Twittad . 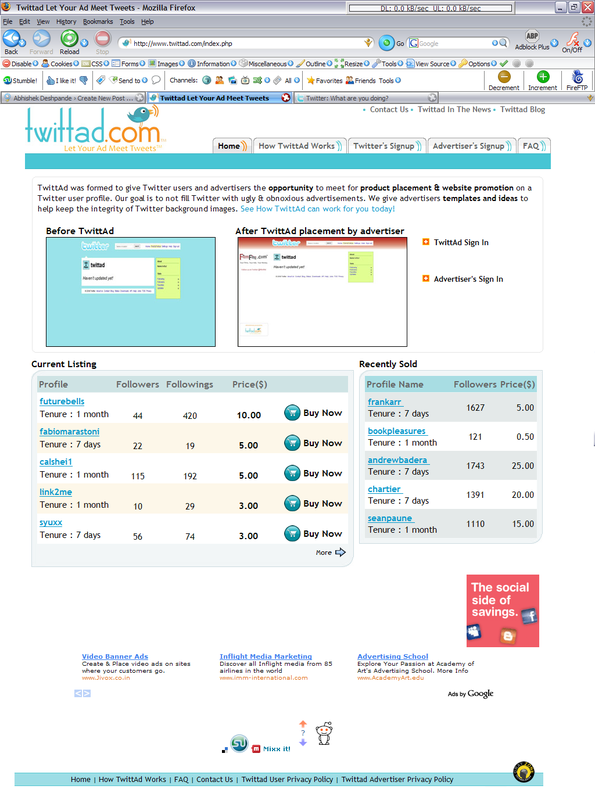 Twittad is a Advertising Agency where User over Twitter sells an Advertising space on his twitter profile page. and Advertiser buys an advertising space for whatever amount. Idea is not really bad. Social Site like Twitter allowing this is really great !! Twittad is working on excellent platform Plenty of users are over Twitter, so by few days Twittad will grow like Adbrite. In footer of above image you can found contextual ads by Google. If a company can’t bring some advertiser to there own site how could they get Advertisers for the Publisher ( Twitter Users) ?? My good luck To Twittad !! Thats really Funny and weird !! Well, thanks for pointing this out! I signed up to see what comes of it! Figured, worst-case is that my twitter home-page gets high-jacked for a month! The tool that came with the registration said somehow my wimpyish 200ish followers (only really been using Twitter a lot the last week or two) was worth $25.02 for a month….will see how it goes!